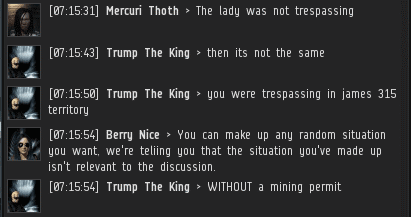 Previously, on MinerBumping... Mercuri Thoth got worked up into a froth when Agents of the New Order destroyed her freighter. Agents Berry Nice and Trump The King were willing to discuss the matter like civilized adults. Despite their help, Mercuri struggled to cope with her loss. Carebears, when you ask an Agent of the New Order to tell you what you're doing wrong, be prepared for a long list. It became clear that Mercuri and Agent Trump had two entirely different ways of looking at the game (and probably life). Trump wondered if they could ever see eye to eye. Mercuri tried to obfuscate her guilt by taking refuge in wacky analogies. But our Agents could not be misdirected so easily. Trump and Berry kept their eyes on the prize. They knew the real issue here wasn't old ladies or Nazis or science experiments--it was the integrity of the Code. Misguided bot-aspirants frequently--and falsely--accuse our Agents of bullying, but they're rarely called "slippery bullies". It was an outrageous accusation. Needless to say, a non-bully cannot be a slippery bully. I believe this is what is known as a "mic drop". Mercuri laid to rest any doubts about whether she was a bot-aspirant. Anyone who's been in EVE long enough to pilot a freighter must surely know the name of the man who rules highsec. Our Agents had difficulty keeping Mercuri's attention focused on any one point long enough to teach her anything. Her mind was wandering all over the place. Once again, Mercuri wanted to talk about the real-life identities of those who had ganked her. Trump The King had nothing to hide, so he was more than willing to reveal his identity. But to what end? What is your real name? Trump the king. Im in tears lol. Yea, I giggled a little. Dagnabit, can't wardec her. Don't want to spoil it, but it seems everything worked out all right. Always triggering little johnnie piddles. Code: Always loving murder, always. Is it the Shardanniversary yet? Your special day of prayer to your favorite child killer, you guys are sick. God you code fucks are sick, I hope you get hung for beating and molesting your children. Has James expressed his sadness that his real life group is losing. Sorry James but ISIS is circling the drain. Yeah but he still has his whole 10 friends still getting ready to shoot people and still acting like they are the best. Code is has and always will be a way for James to get people to kill in real life. 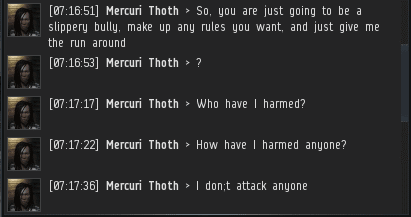 CCP needs to release their names and have the cops remove their kids from them, we all know they molest and beat them. Its part of the code. 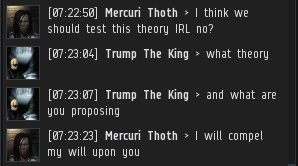 Did I read correctly that the miner wishes to test The Code in real life? What's your guess, will he join a respectable law enforcement group to work on the betterment of society? Or will he kick people in wheelchairs? Why is it that I can't trust the judgement of a miner in such a delicate distinction? Why is it we cannot trust radicalized code agents in real life. Right they kill people. So yeah keep trying ISIS. Code sicko's bettering real life, don't make me sick they kill people and act so proud of it they celebrate the fact like the shardani guy who killed his kid, they praise him often and say it was to prevent his kid from becoming ag or something. Sick fucks need to understand that murder is not ok.
Code child molesters = Grade A scum. I like how Mecuri Thoth compares freighter hauling to someone in a wheel chair. It's better to compare her to a trucker driver loaded with kilos of coke trying to cross the border. And code is ISIS fair enough child killer. Just like code agents going out and killing people IRL. You guys need to seek help, terrorism is not a good thing. I'm glad I don't play this game anymore!